The aforementioned excerpt from “Sleepless Mind” is part of Hubert Malcom’s body of work titled, Silent Thoughts from the Active Mind. His book is sixty-seven poems canvasing one hundred sixty pages that painterly portray Malcom’s philosophy. The selected works are a prose style accompanied by vignettes. 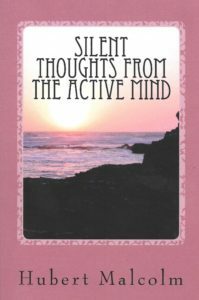 Hubert Malcom’s book, Silent Thoughts from the Active Mind, is the author’s examination and experience of life with an intimate outlook that inclusively welcomes everyone.